As the world continues to become more tightly connected, the people who wield the most influence evolve. Michael Torres, VP of corporate affairs (Americas) at InterContinental Hotel Group, told attendees at last week’s annual PR News Measurement Conference in Philadelphia that “we [should be] less concerned about platforms and prestige, and more concerned about a specific person’s ability to influence high-value targets that matter.” Influence is everything, he says, especially as lines between traditional and social media continue to blur. He added, "However, don't fall victim to the belief that impressions are everything. It's really about high-concentration and density of reaching your high-value targets." Before deciding which influencers are going to be the most valuable for your brand, it’s important to understand any group of people in relation to your company using a specific framework, Torres said. You may have friends (people who already love your organization), foes (people who don’t) and persuadables (people with a neutral view who haven't formed an opinion yet). Though keeping tabs on your foes is important, focus more of your efforts on working with influencers who can reach your friends and especially your persuadables. This is where data comes in, Torres continued, explaining that IHG uses a combination of automated data collection and human analysis to “identify and segment influencers across the friends, persuadables and foes continuum, which in turn will help...identify allies to leverage.” Torres also said that his company’s research has concluded that the most influential people, both on a macro and micro level, share three key traits: reach, relevance and resonance. 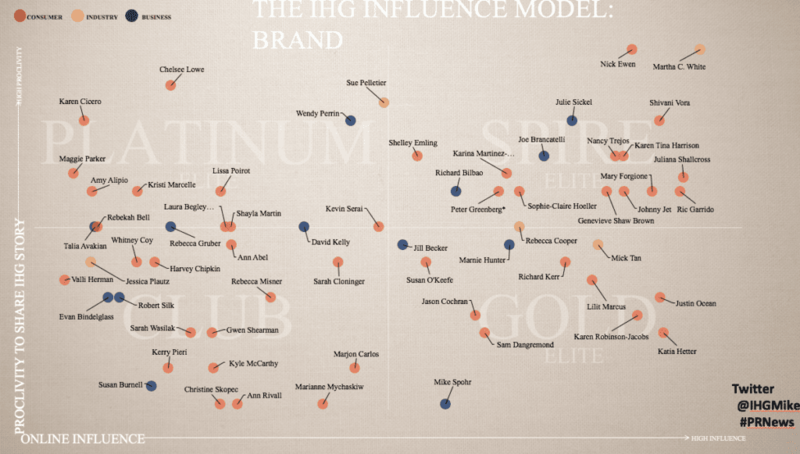 IHG employs an Influential Media Methodology, which involves collecting data about influencers, creating a database of those who have the most relevant connection to high-value targets, ranking that database in relation to the three key traits and generating a graph-based report which plots against an x and y axis “a proclivity to tell IHG’s stories in a positive manner” and "quality of online influence." Connected Industry Elites: Torres explained that these are strong online influencers but they may not be inclined to share all of your company’s news and messaging. 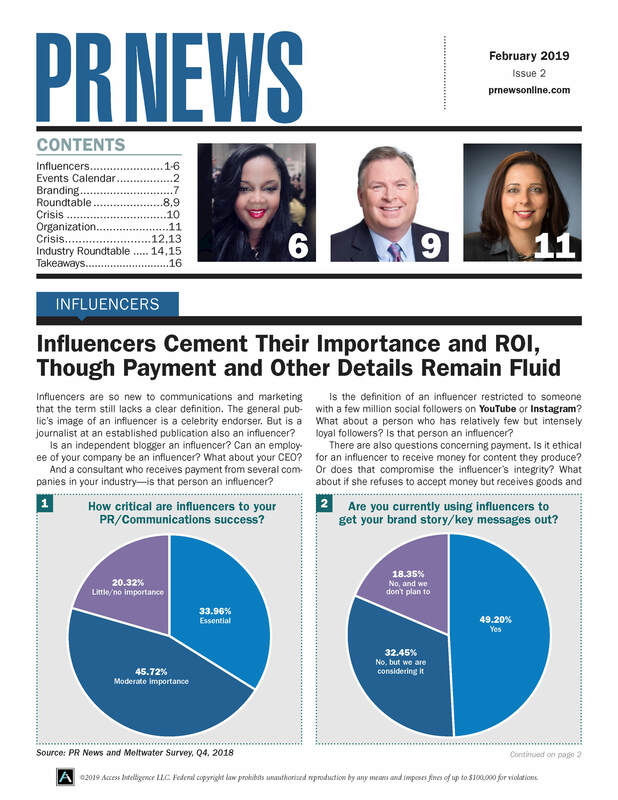 If you can, build personal relationships with these influencers and “go the extra mile” to make them more inclined to disseminate your messaging to their followers. Passionate Voices: These are influencers who love your brand but “lack the social reach of the more savvy influencers,” Torres said. Building a relationship here can be mutually beneficial: You can help the influencer increase their profile by feeding them news and content that's of interest to them and that can lead to organic engagement. Popular & Savvy Promoters: Torres stressed that this quadrant should get information first. They are the people with a high level of social influence and engagement and have the highest level of online connection to your high-value targets. Torres said that influencer marketing, and communications in general, is an “iterative process.” Be prepared for some twists and turns, and always be testing for what works now, not just what worked in the past.